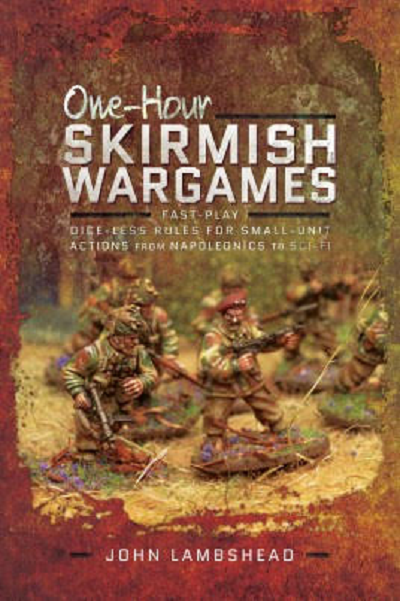 ​Many wargamers enjoy the challenge of skirmish games where, instead of the strategy of vast armies portrayed by traditional wargames, the focus is on the tactics of a small unit. However, skirmish rules are often so complex that it can take hours of rolling dice, consulting tables and recording data to recreated what should in reality be a fast and furious firefight lasting just minutes. Now, these new rules make it possible to recapture the speed and intensity of these actions, where every man, and every second counts. The basic rules are supported by sections which give special rules and scenarios to capture the flavor of a range of different periods, from Napoleonic to Modern Warfare and beyond with SCI-FI. From the 95th Rifles scouting for Wellington, Western Gunfights and WWI Trench Raids, through WWII Parachute Assaults or Special Forces Strikes to Afghanistan, or even Space Marines storming a space station, Squad Firefight's elegantly simple system allows you to focus on proper tactical decisions rather than rolling buckets of dice or calculating masses of modifiers. Dr. John Lambshead designed the award-winning computer game; Frederick Forsythe's Fourth Protocol, which was the first icon-driven game, was editor of Games & Puzzles and Wargames News, and has written a number of wargaming rules supplements for Games Workshop. He also wrote the officially licensed Dr. Who gaming rules for Warlord Games. He was co-author, with Rick Priestley, of Tabletop Wargames. a Designer and Writer's Handbook (Pen & Sword Books 3016). When not designing games he is a novelist writing SF&F for Bane Books. He lives in Rainham, Kent UK. Pen & Sword is based in the UK. This book is soft-cover and contains 108 pages in 9" x 6" page format. I has only 8 illustrations in it of board layouts. There are 7 blank pages at the end of the book to use to write notes on. This book will be of great interest to wargamers.